As we drove out of Yosemite, we headed for Arizona, for Page. Just off the highway, about 2 miles from the town of Page, is a geological curiosity, and a photographer's haven called Horseshoe Bend. 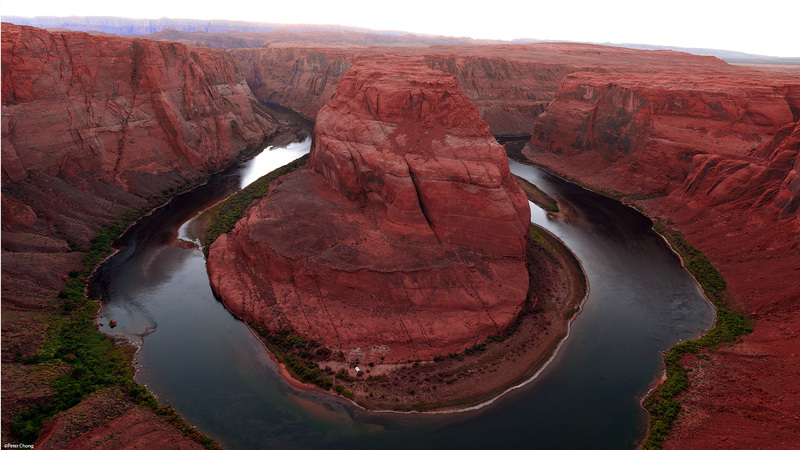 The Colorado River negotiates an almost 360 degree turn around this large rock, just downstream of the Glen Canyon Dam, and Lake Powell. 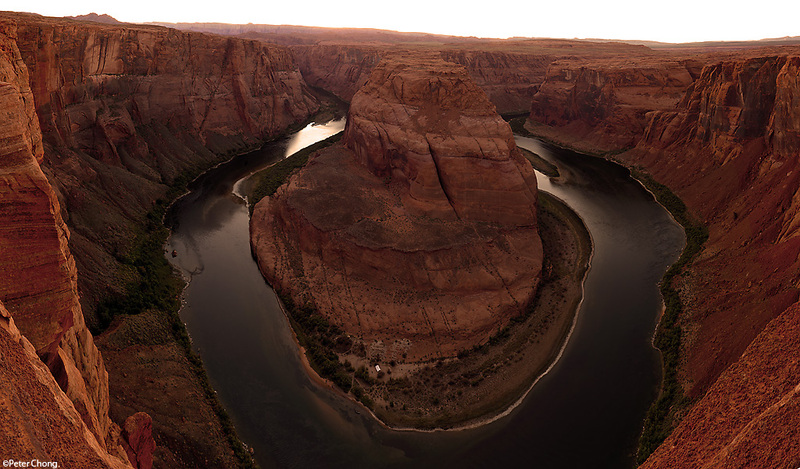 As the river and the rock is part of the Glen Canyon National Recreation Area, it is open to boating and camping. 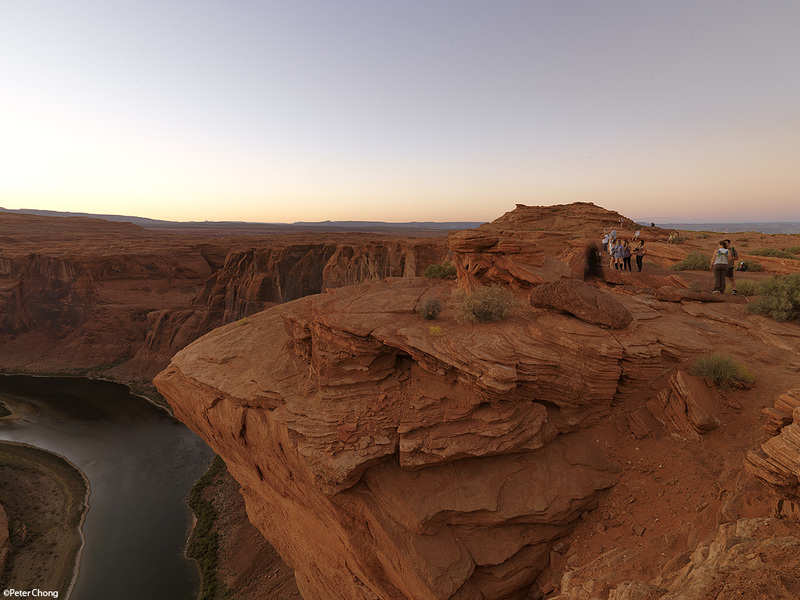 The lookout is rather terrifying, my tripod is positioned some 1000 ft (about 320m) above the Colorado River. This is quite a scary thing...there are no barriers between you and the sheer drop. From the lookout point, photographers and tourists alike stand, sit, squat at a few protuding rocks to admire the unique landscape. To shoot this picture, I selected the ultra-wide Hasselblad HCD4/28 lens, which provides approximately 90deg diagonal field of view, approximately what a 21mm would give on a 35mm full frame dslr. I selected this lens for two reasons: firstly it allowed me to take in the entire view in one go. Secondly, and perhaps more importantly, it provided me with a perspective which suggest a vertigo effect with the awesome drop. Stitching with a 80mm lens, which provides a normal perspective would rob me of the ability to convey this. I metered to place the rock in zone 5. This photograph was taken about an hour before sunset, the sun itself was just about off the frame on the top. I shaded the lens, careful not to cause it to vignett with a hat. You can still see some detail on the far background, but that part of the image would have fallen at Zone 9 or 10, hence a slight haze can be seen. The sun itself is off frame. The red of the light makes a more aggressive looking rock. The colours were enhanced slightly by pushing the saturation in CS4 slightly. The 1024 wide picture shows a bit more sky, and on clicking, the 1920 wide image, being 16:10 in aspect allows me to crop the sky out. But the image left me a bit dissatisfied to suggest vertigo. I tried again, later in the evening, with an even larger field of view. I elected to remain with the 28mm, but stitch 3 frames to form one panorama. I could have covered the scene with perhaps 4 shots from the HC2.8/80, a lens which would provide a normal field of view, as would a 50mm on a DSLR. But I wanted to make the perspective even more scary...to draw the viewer into the immense drop, while allowing him to admire the details. To provide this perspective, I had to remain with the 28mm lens instead of the 80mm, but to include more of the sides. This squeezing of the scene exggarated the perspective even more, and makes a stronger image, suggesting vertigo to some people, especially the larger image when clicked or when printed full size. A friend of mine told me that he had an urge to jump by looking at the image, so he can experience the textures as he enters the image. Shot just minutes before sunset, the light was failing and changing fast, but you can see the sky is totally blown out, as the sun was setting directly across from us, and in the frame. The golden rays catching the sides of the canyon making it glow. The rock itself is in shadows. I wanted to capture this almost dusk feel for the image, so I metered the sky as zone 10. The sun is actually just about smack in the middle of the picture...but metering the sky at zone 10, meant that the brighter sun was blown out in the sky...erasing it from the image with a featureless, white sky. I cropped the sky out a bit, so the expanse of white is less threatening. This exposure scheme, allowed the rock to be placed in zone 3, and the sides of the banks at zone 5. This, I believe captures the visualization I had in my mind's eye of the scene, as it was dusk. I am undecided if I prefer the darker dusk photograph or the brighter one. Both are of the same subject, same shooting position, but treated differently in shooting techniques, resulting in two photographs with vastly different emotional impact. Which one do you prefer? A view of the people around the side...looks dangerous? it is! its a sheer drop of 1000ft, with no barriers between you and the edge of the cliff. 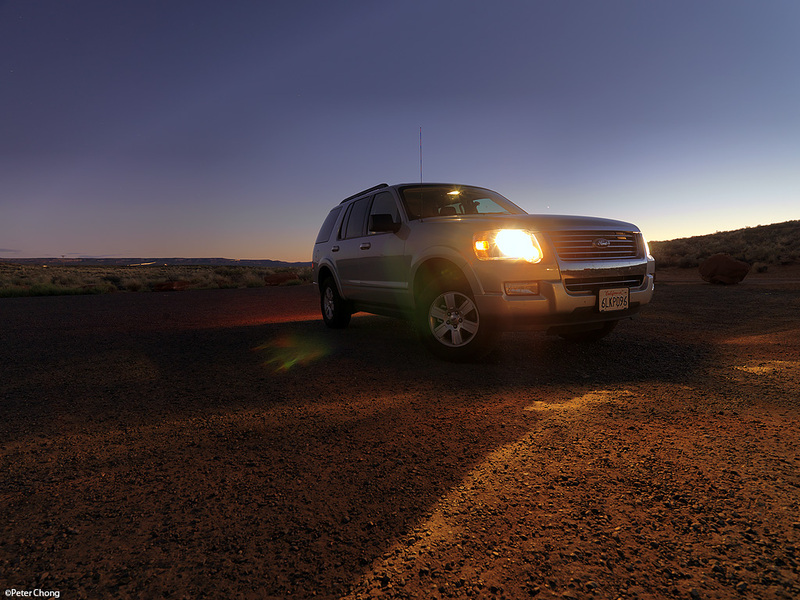 and just for fun...my transport during the SouthWest USA tour...we clocked some 3000 miles on this SUV...Ford Explorer. 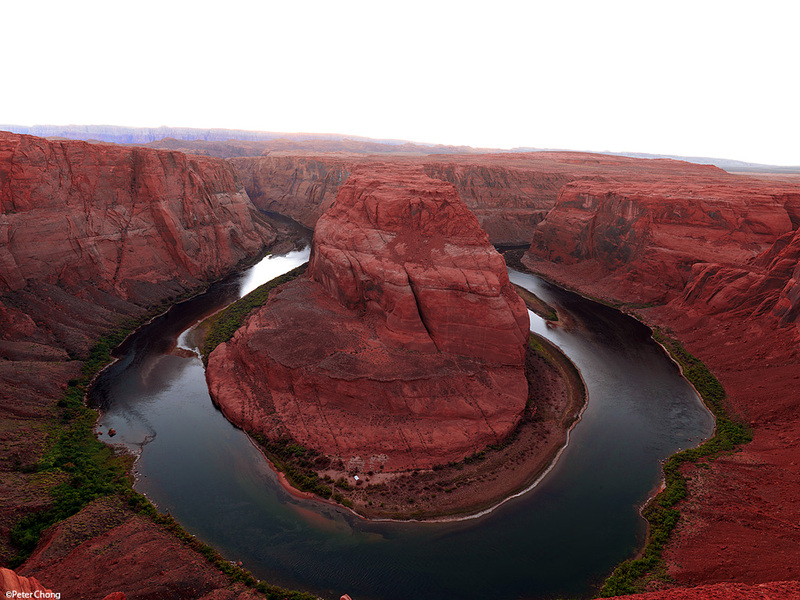 Shot minutes after sunset in Page, at the car park leading to Horseshoe Bend. Peter, I've not been here but have seen enough photographs to imagine how I would photograph it myself: reinforce the view of the grand landscape. I like the second wider photograph much more. And likely due to the direction of the light, there is a lot more visible texture on both canyon walls, completing the illusion that I am standing there myself. The inclusion of the left-most wall helps anchor the image and establish the viewer's position relative to the rest of the composition. Vertigo achieved. Bravo. For more information on USA National Parks visit “Altiusdirectory.com -> Attractions -> National Parks List”. To Dodge or not to dodge?